Color. The color is the first thing you notice about a pearl. While the color will vary widely depending on the type of pearl you’re looking at, pay attention to two things: the body color, and the overtone color. The body color is the primary hue of the pearl, while the overtone color is the sheen or the color that ‘pools’ on the surface of the pearl. For example, a pearl might be white with rose overtones, or black with green overtones. ◦Always examine a pearl’s color against a white backdrop, such as a piece of white velvet or a similarly glare-free fabric. ◦Use diffused full-spectrum light when examining the pearl’s color (we advise our costumers to go outside with the daylight witch is better than artificial light). If you’re buying a strand of pearls, always examine the colors of each of the pearls in contrast to the ones next to it. Luster. Similar to looking at the color of a pearl, the luster refers to how much shine/reflection a pearl has. The shinier a pearl, the more valuable it is. When examining the luster of a pearl, see how closely the reflection resembles a mirror, and how much light it reflects. The more of a mirror-image the pearl is able to provide, the higher the value. ◦Luster is easy to examine in a round pearl, while it is more difficult to examine in a baroque pearl because of the many contours. Check the whole pearl to make sure the luster is the same the whole way around. Surface. Entirely round pearls are very rare; most are a bit off-round or lumpy, with minor surface imperfections. You should examine each pearl on a strand, looking at the surface (im)perfection. There may be small marks, grooves, or lumps on the surface of the pearl. These are the result of other foreign bodies inside the oyster brushing against the pearl while it is being made. On the flip side, you want to make sure that imperfections on the pearl have not been removed. Sometimes pearls are ‘worked’ - sanded down - to reduce blemishes on the surface, but this lowers the value. You can see if a pearl has been worked if there is a change in luster or obvious texture difference on a certain part. Size. The size of a pearl will vary depending on the type of conditions it was grown in, and the size of the original bit of debris at the center. Larger pearls are obviously more valuable than smaller ones, because they are much more rare. The bigger a pearl, the larger the original bit of sediment, and the longer it was left to ‘cure’ in the oyster. The size of any particular pearl will range from 3mm to 12mm, although you may find some that are smaller or larger than this. When examining a strand of pearls, it is ideal if they are all the same (or very close in) size. ◦ Round: perfectly spherical with no surface blemishes. ◦ Off-round (or near round): slightly wider on one side of the pearl, but not elliptical. Off-round pearls can be easily passed off as round pearls in a strand. ◦Oval: rounded with a significant difference between the length and the width. A step further than an off-round pearl. ◦ Drop: egg-shaped with one end that’s rounded, and one end that’s slightly pointed. ◦ Button: a mostly round pearl, with one or two asymmetrical curves. ◦ Mabe: a round pearl that is flat on one side, creating a half circle. ◦ Baroque: a ‘natural’ pearl with lots of lumps and asymmetrical curves. Nacre. The nacre is the substance excreted by the oyster that creates the pearl, when built up over the nucleus object. The longer a pearl is left inside an oyster, the more nacre it builds over time. As a result, highly nacreous pearls are more sought-after than low or non-nacreous pearls. A high amount of nacre increases the luster of a pearl. You can tell if a pearl has thin or medium nacre if you can see the nucleus reflecting inside, or if the exterior scratches away easily. The more nacre a pearl has, the stronger it is. Pearls grown in clams and conches are non-nacreous. ​Similarities on a strand. If you are purchasing a strand of pearls that is staying together as a set, it is important that you find a strand with pearls nearly identical to each other. The more similar each of the pearls is in a strand, the more cohesive the overall look is. Compare and contrast each pearl up close, and look at them next to each other from a bit of distance away. Pay attention to the overall color, size, shape, luster, and nacre qualities of each of the pearls as your compare and contrast. The exception to this rule is a strand of baroque pearls; pay attention to color and luster, rather than shape. And for Tahitian pearls, multicolor is trendy, not necessary uniform. Wearing pearl since several decades and by experience, I, personally think that when you decide to buy a strand of pearls, you have to fall in love. After all, you will spend your life with. Treasures from the earth’s rivers, lakes, seas, and oceans, pearls have always embodied the power and life-sustaining nature of water. The natural pearl is quite likely the earliest gem used for adornment. Our ancestors foraged seashores and riverbeds collecting mother-of-pearl shells for ceremony and exchange. 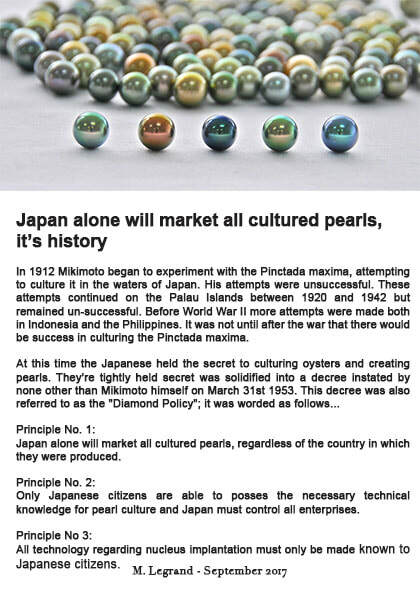 When a rare pearl was found, it became a sacred possession. Ancient Persians associated pearls with tears of the gods. Ancient Greeks believed they were created by moonlight on the water. To ancient Chinese, they guaranteed protection from fire. For Europeans, pearls symbolized modesty, chastily, and purity, and are still considered traditional gems for brides. While natural pearls remain very rare, pearls today are no longer the sole property of royalty and the wealthy. Thanks to advances in modern culturing techniques, pearls are one of the most accessible gems worldwide.